Simio employs Risk-based Planning and Scheduling (RPS) that extends traditional APS to fully account for the variation that is present in nearly any production system, and provide the necessary information to the scheduler to allow the upfront mitigation of risk and uncertainty. RPS is a simulation-based approach that makes dual use of the underlying simulation model. 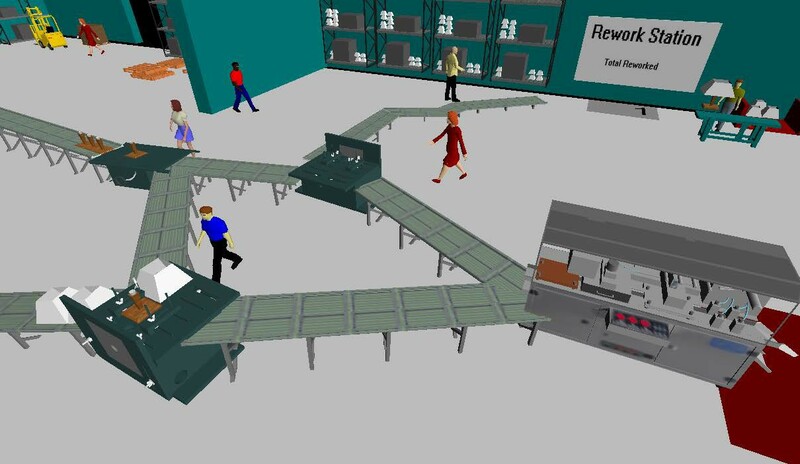 The simulation model used in RPS can be built at any level of detail and can incorporate all of the random variation that is present in the real system. RPS begins by generating a deterministic schedule by executing the simulation model with all randomness turned off. Note that this is equivalent to the APS solution. However RPS then uses the same simulation model with randomness turned on to replicate the schedule generation multiple times (employing multiple processers when available), and record statistics on the schedule performance across replications. The recorded performance measures include the likelihood of meeting a target (e.g. due date), the expected milestone completion date (typically later than the planned date based on the underlying variation in the system), as well as optimistic and pessimistic completion times (percentile estimates, again based on variation). To learn more about why variation matters so much, refer to the special report Risk-based Planning and Scheduling: Why Variation Matters! By Dr. Dennis Pegden. The following shows and example RPS Gantt chart with the targets showing the likelihood of being met, and color coded based on the level of risk. 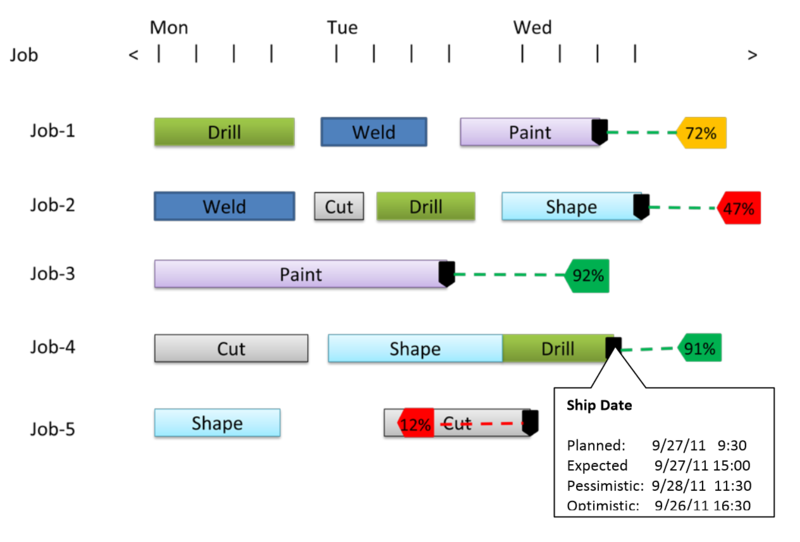 A tooltip shows planned, expected, pessimistic, and optimistic ship dates that are generate from the replicated simulation of the schedule generation. Although the use of simulation for RPS is new, simulation has a long history of success across a wide range of application areas for analyzing and improving system design. For example simulation models are routinely used to evaluate changes in a production line or to evaluate and compare new facility designs. Simulation lets you see the impact of change. You can quickly make changes to your model to test out your ideas without disrupting your real system. With simulation you make your mistakes in the model, and not in your business. Simio Enterprise, based on RPS, now brings the power of simulation – traditionally reserved for system design – to the day to day operations of a facility. Simio allows a single simulation model to bring value in two ways: the traditional use for analyzing and comparing system designs to reduce cost and improve the system performance, and the new RPS application for improving the day to day operations of the facility. A Gantt chart displays time bars spaced across a timeline, where the length of the bar represents the duration of some activity. A Gantt chart can be used to show the steps in processing all jobs across a specific resource. This type of Gantt is called a resource Gantt because each row in the Gantt is a specific resource, and the time bars are specific steps for all the jobs that are processed on that resource. A Gantt chart can also be used to show all the resources used in processing a specific job or order. This type of Gantt is called an entity Gantt because each row in the Gantt denotes a specific entity (job or order), and the time bars are the resources required to process that entity. The Gantt chart shown earlier for displaying risk analysis is an entity Gantt. The chart shown below is an example of the corresponding resource Gantt. Simio RPS provides both a resource Gantt and entity Gantt. Besides providing useful information for assessing the risk and constraints associated with specific jobs, the Gantt charts can also be used to directly edit the resource and job properties. For example you can click on a job in the Gantt and change its priority or click on a machine and change its job selection rule. You can also directly enter machine breakdowns and overtime directly on the resource Gantt. As we will discuss later the types of changes that can be made by the scheduler are flexible and can be configured during the development of the Simio RPS model. Simio RPS employs a facility model that may be developed using any of the popular Simio simulation products. You can also use the same model that is developed for evaluating changes to your facility design to drive a Simio RPS installation. Hence a single model can be used to drive improvements to your facility design as well as assist in day-to-day operations.